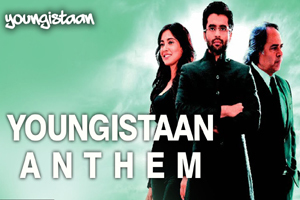 Hindi Lyrics 4 U: Lyrics Of "Youngistaan Anthem" From Movie - Youngistaan (2014). Lyrics Of "Youngistaan Anthem" From Movie - Youngistaan (2014). A rock song sung by Shree Isshq featuring Neha Sharma, Jackky Bhagnani. Star Cast: Jackky Bhagnani, Neha Sharma, Farooq Sheikh, Boman Irani, Kayoze Irani, Meeta Vasisht. The video of this song is available on youtube at the official channel of T-Series. This video is of 2 minutes 28 seconds duration. ?? ko bechne ko kya tum sab taiyaar ho, haan aa..
haan me haan milado yaaron ungli apni utha do, haan aa.. Lyrics in Hindi (Unicode) of "﻿यन्गिस्तान एंथम"
﻿?? को बेचने को क्या तुम सब तैयार हो, हाँ आ..
हाँ में हाँ मिलादो यारों ऊँगली अपनी उठा दो, हाँ आ..